What year would you think that was made? How about this one? Both of those objects date to around 1880 and they were designed by Christopher Dresser, a man regarded as the world's first, independent industrial designer. 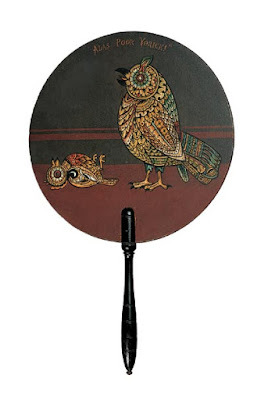 I saw both at a retrospective of Dresser's work back in 2004 at the Cooper Hewitt in New York. The museum displayed a collection of Dresser's creations in an exhibit called The Shock of the Old. 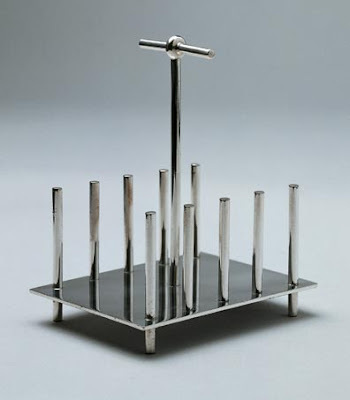 The exhibit then moved on to London's Victoria and Albert Museum where it was called Christopher Dresser: A Design Revolution. 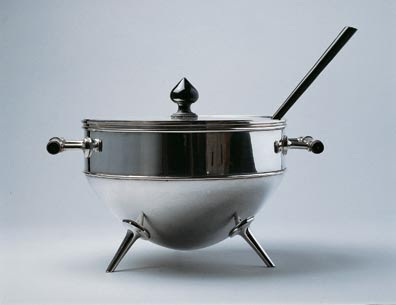 I was reminded of that exhibit because I'm working on a post with the marketing folks at MOMA on exhibit they have coming up about modernist kitchens in the early 20th Century. That's coming next week, but I want to dwell on Mr. Dresser here today. Dresser's popularity at the time shows that the Rococo mishmash of ornamentation that most people think of when they think Victorian wasn't universal. Dresser was an industrial designer, his work was meant to be mass produced and to sell. Of course some of his projects were more typical of the time. But what interests me about him are his projects that look forward to a new era all together. He was from all accounts an interesting man. He was a botanist by trade and was awarded his doctorate before he traded in his study of plants for the study and creation of objects. 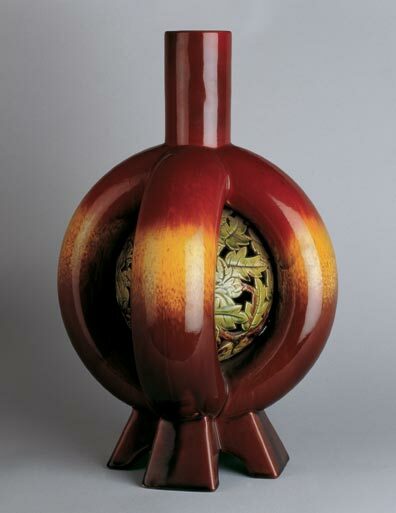 It was through his observations of the economy of plant design that he started to rethink the decorative arts. A trip to Japan in 1876 altered his views on ornament permanently. His willingness to look to the forms of other cultures, notably Japanese and Arabian, and to integrate them into his work spawned the wide acceptance of these forms and styles. 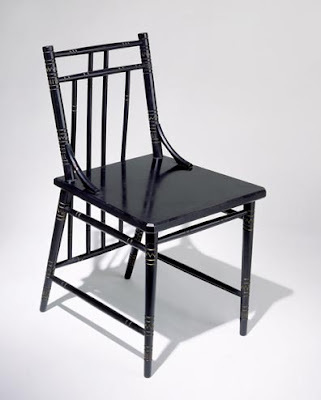 Like many of his contemporaries, Dresser was involved in the movement to reform design. Remember that the later 19th Century was a time of great reform movements. The wealth generated by the industrial revolution spawned a class of people who were determined to reform and reinvent their entire society. Design reform was of a piece with sanitary reform, prison reform, workplace reform, etc. The Victorians reformers were going to improve the lot of everybody. 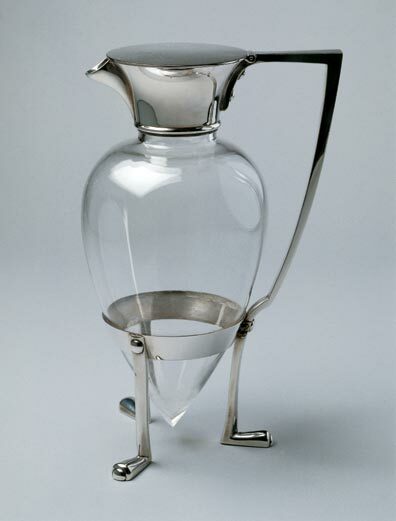 Design reform was an attempt to mass produce tasteful objects for the middle and lower classes. Dresser's unadorned objects were not only new, they were less-costly to produce and his sensibilities fit the time when he lived to a T.
Christopher Dresser was a household name in England by the time he died in 1904, I don't think it's a stretch to say he was the 19th Century's Philippe Starck. 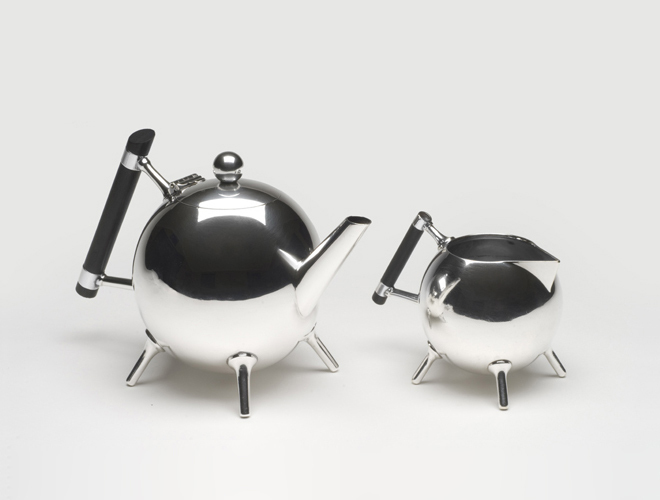 He was a fascinating man and you can read more of Dresser's biography on the British Design Museum's website. I'm old enough to have had a great-grandmother who was keeping house at the time when Dresser was plying his trade. I wonder what she would have thought of his take on their times, the Victorian Era? Fantastic post! The fact that he was a botanist clearly shows in his work. Love the organic shapes. True art is timeless. There is a definite plant-like quality to this stuff and I think it's wild that he didn't end up in a place that looks more Art Nouveau-like. 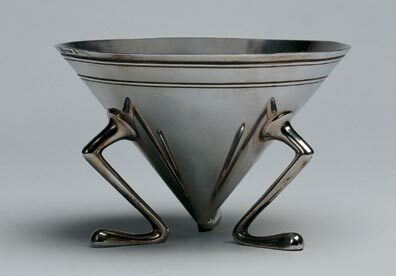 1880 predates Art Nouveau but Art Nouveau caught on a lot sooner than modernism did. Some of this work is a huge departure from what was going on in 1880 this stuff had to have been controversial. Talk about being ahead of one's time! 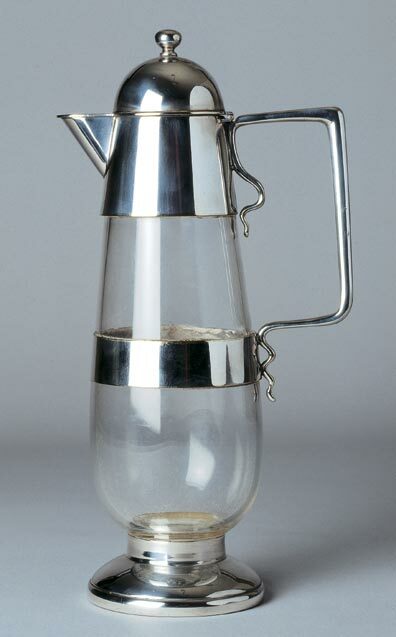 The teapot and creamer are stunning. Alessi did a limited edition series of Dresser reproductions, including the two tea post at the top of this post. 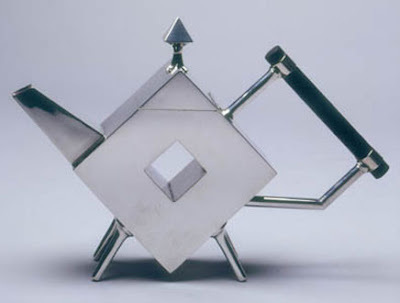 I think Dresser's Diamond gives Michael Graves a real run for his money. Holy crap! Shows how much bigger the world is than we allow it to be. Amazing work, a quantum leap: this man's vision was larger than life was proscribed to be in his time. 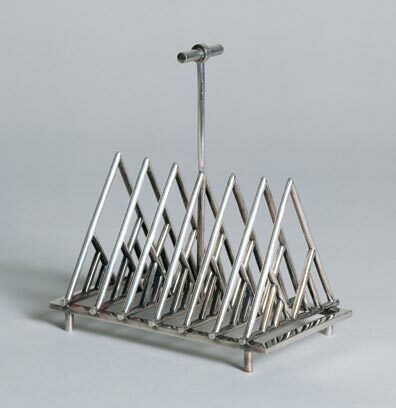 Design reform indeed - Mr. Dresser was an anarchist! He was an anarchist who was also a household name. I think we don't give out Victorian predecessors enough credit. Very cool post - puts a very different perspective on that time period. Can't wait to see the MOMA stuff! No Brenda, all of that stuff was made in British workhouses. As horrific as conditions were in a workhouse, at least they kept everything local! My eyeballs nearly fell out of my head! Tell me about it. The inscription on the fan at the end reads "Alas poor Yorick." Clearly the guy had a sense of humor too. Amazing! One of those things that they forgot to show us in design school. I learn so much from you. They forgot to show you because his work doesn't fir the script that design periods work in an orderly fashion. He was playing with what would become art nouveau, arts and crafts, art deco and modernism and since he was doing it in 1880 it has to be ignored. That's what I say anyhow.